To anybody who regularly attends local events in Gairloch, Campbell probably needs no introduction. Campbell was an engineer with the RAF and operated a very successful mobile disco. 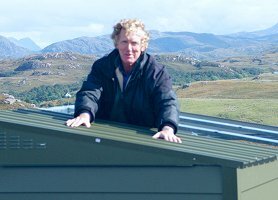 He moved to Gairloch to run the popular Sands Hotel, but now spends his time sailing, surfing and snow-baording! Campbell presents 'Craic at Dawn' on Wednesday mornings from 7.30 to 9.00, often joined by Andrew Rudge of the Hillbillies Bookshop, and he presents our country music programme and various other shows.